So, it's like Bitcoin then? Well, yes and no. The two share the fact that they're built using distributed public network technology – known as blockchain – but that's really where the similarity ends. Bitcoin offers a single application, a peer-to-peer electronic currency system that allows online payments. It's essentially a currency in its purest form. While Bitcoin uses blockchain technology to track who owns Bitcoins, Ethereum uses blockchain as a platform for running almost any decentralised application. Bloomberg has described it as "shared software that can be used by all but is tamper-proof." 1 So the possibilities really are endless! Where Did Ethereum Come from and Who Invented It? Ethereum was originally created by Vitalik Buterin, a cryptocurrency researcher and programmer who previously worked on Bitcoin, in 2013. An online crowdsale, held in 2014, formed the core part of funding for the new platform. The system went live on 30 July 2015, populated with 11.5m 'coins' ready for presale. In the Ethereum blockchain, instead of 'mining' for Bitcoin, users work to earn 'Ether', a type of cryptocurrency that fuels the wider network. Beyond being a tradeable cryptocurrency, Ether is also used by developers to pay for services on the Ethereum network. A blockchain is a public ledger which keeps track of all transactions that have ever been made on a specific network. It's constantly being added to when blocks are 'completed'. Blocks are added to the blockchain in chronological order. Each computer that's connected to the specific network (e.g. Ethereum or Bitcoin) gets a copy of the blockchain, which is automatically downloaded upon joining that network. With a blockchain, it's possible for many people to write entries and a community of users can control how the record of information is amended and updated. It's a bit like Wikipedia, in that sense. Each entry is uploaded and then edited, no one person controls the information contained within it. 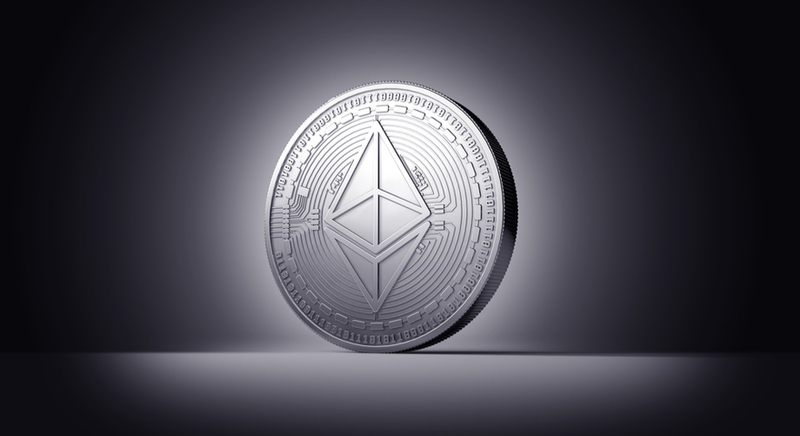 In terms of Ethereum's cryptocurrency, Ether, the blockchain acts as a kind of database, which keeps track of all ownership and transactions that are carried out on the Ethereum network. Where can you spend Ether? Ether is increasingly being used to pay for certain goods and services online, within the Ethereum network. 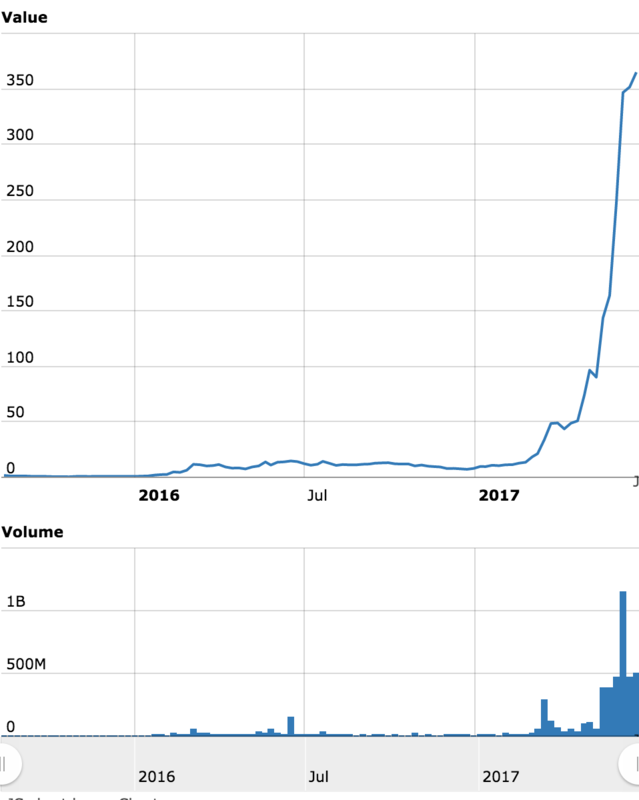 As can be seen in the chart below, since Ethereum's inception in 2015, its cryptocurrency, Ether, showed slow progress in its first year. 2017 has been an entirely different story, however. The cryptocurrency started the year on a meagre $9.76, since then this price has hit the all-time-high of $407.10, that's an increase of over 5000%2. Why Is Ether's Price Rising So Fast? What's the cause of this rapid bullish trend? Well, the answer is simple and complicated in equal measure, and comes with increased investor awareness. As the public become more and more informed about cryptocurrencies like Ether and Bitcoin, the more interest is generated. The case of Ether is even more interesting, really. It's had such a mighty boost in price almost exclusively because it's 'like' Bitcoin and investors want to jump on the boat early when prices are moderately low (at time of writing 1 Bitcoin is equal to around $2660!3). Is Ether Safe? What Are the Risks of Trading Ether? Ether is perfectly safe but, as with many instruments offered by Admiral Markets, it can have moments of high volatility, which adds to its intrigue with traders, of course. We always recommend that our traders use our volatility protection settings, which can help minimise risk while trading. We also encourage our traders to learn how to manage risk effectively. Did you know, you can now trade cryptocurrencies with Admiral Markets! We have recently opened up four currencies for demo trading – allowing you to hone your trading strategies with these new and dynamic instruments. Aside from Ethereum, Admiral Markets also offers Bitcoin, Litecoin and Ripple for demo trading and will soon open up all four currencies for live trading! Keep an eye on our upcoming webinars for updates and also check our dedicated instrument pages for more expert analysis of our new cryptocurrency range!